The 17th edition of Festival Mediterranea was officially launched by Teatru Astra and Bank of Valletta, during a press conference held at BOV's head office in Santa Venera on Tuesday 10 October 2018. The highlight of the month-long festival is a double representation of Giuseppe Verdi's popular opera La Traviata on the 25 and the 27 October. Gozo Minister Justyne Caruana, who addressed the press conference stated that one of the objectives of the Ministry for Gozo is to bring culture in all of its forms, including the opera, closer to the citizens. Given that the opera is synonymous with Gozo, the Ministry has launched an 'Opera month' where a number of activities in collaboration with the opera theatres and other stakeholders are being organized and which aim towards extending the opera beyond the theatre and closer to the community. These events include talks, concerts and exhibitions on related themes. Minister Caruana insisted that the cultural heritage fostered by communities should be supported to be enjoyed by future generations Ã¢ and for this purpose, the Ministry for Gozo is investing heavily in such initiatives. Minister Caruana concluded by thanking the musical societies for their commitment towards opera in Gozo and also the large number of volunteers involved in these projects. 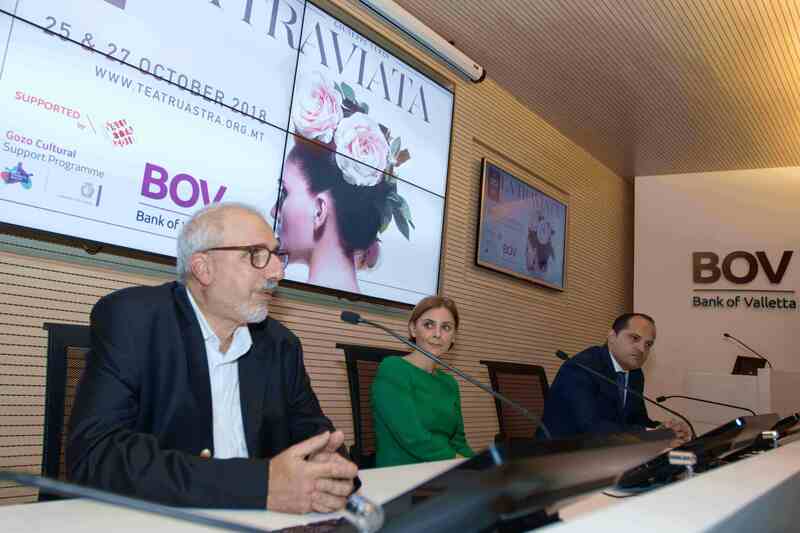 Festival Chairman Michael Formosa stated that La Traviata will be marking a significant milestone in the development of the arts in the Maltese islands, the 50th anniversary of the inauguration of Tetatru Astra, but it will also be consigned to history as the first opera at the Astra in forty years which will not be conducted by Prof Joseph Vella. He echoed the tribute given to Mro Vella by Mr Mario Mallia and stated that the theatre has now the responsibility to take forward an important legacy, in which Mro Vella was a key protagonist. Formosa concluded by stating that the opera at Teatru Astra and Festival Mediterranea have established themselves as main highlights in the Maltese cultural calendar, profiling further Gozo and the community which has animated Teatru Astra over an extraordinary journey which now marks 50 years. A star-studded cast will front La Traviata. Gozo's own Miriam Cauchi will interpret Violetta. Giulio Pelligra who wooed audiences in last year's Lucia is entrusted with the role of Alfredo. Bolshoi fame baritone Maxim Aniskin will interpret Germont, while mezzo Oana Andra will return to the Astra as Flora. Internationally acclaimed Philip Walsh will conduct the opera. Leading Italian artistic director Enrico Stinchelli will be directing his eighth opera at the Astra. The 2018 Festival Mediterranea will include a series of talks led by Dr Abraham Borg, Dr Godwin Vella and Dr Mark Sagona, on the opera La Traviata, and historical and artistic aspects connected to Gozo. The Hagar Museum in Victoria will feature an exhibition on the theatre's 50 anniversary. A special attraction in the 17th edition of the festival is the Oxford Girls Choir (UK) who will perform exclusively in the festival on the 24 and 26 October - in concerts at St George's Basilica and Kempinski San Lawrenz Hotel, during the opera weekend. Other events will highlight Gozo's wine traditions and the La Stella Band soloists in a chamber concert. The opera La Traviata is supported by the Gozo Cultural Support Programme managed by the Arts Council Malta and Ministry for Gozo. Online booking and other information on the opera and festival is available on www.teatruastra.org.mt.